Custom Dynamics® Flat Turn Signal Adapter is designed to convert ProBEAM® bullet style LED turn signal inserts to flat style inserts for installation on 1986-2013 Electra Glide® Models, 1986-2019 Road King® models (Except Road King Special), 1986-2017 Heritage Softail®, 1999-2003 Road Glide® & 2005 Road Glide® Classic. The Flat Turn Signal Adapters attach to the ProBEAM® bullet LED turn signal using a modular tab design. Made from light weight aluminum, the Flat Turn Signal Adapter tabs bend to secure the LED cluster to the adapter. The assembled unit can then be installed inside the Harley-Davidson® OEM flat turn signal housing with ProBEAM® Flat Turn Signal Lenses (sold separately) using the stock screws. Must be used with Custom Dynamics® ProBEAM® Bullet LED Amber/White Dynamic Ringz™ (sold separately) and ProBEAM® Flat Turn Signal Lenses (sold separately). ProBEAM® Flat LED Turn Signals also available as complete assembly; includes LED turn signal, Flat Turn Signal Adapter, and ProBEAM® Flat Turn Signal Lenses. 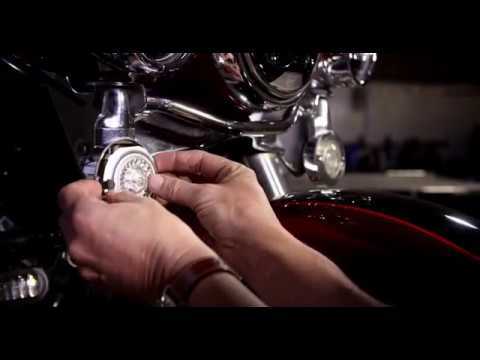 Custom Dynamics® Flat Turn Signal Adapter is designed to convert ProBEAM® bullet style LED turn signal inserts to flat style for installation on 1986-2013 Electra Glide® Models, 1986-2019 Road King® models (Except Road King Special), 1986-2017 Heritage Softail®, 1999-2003 Road Glide® & 2005 Road Glide® Classic. Custom Dynamics® Flat Turn Signal Adapters must be used with Custom Dynamics® ProBEAM® Bullet LED Amber/White Dynamic Ringz™ (sold separately) and ProBEAM® Flat Turn Signal Lenses (sold separately). ProBEAM® Flat LED Turn Signals also available as complete assembly; includes LED turn signal, Flat Turn Signal Adapter, and ProBEAM Flat Turn Signal Lenses.